You can make appointments on available time slots. A practitioner’s available times are indicated by session colours. These are set in the appointment templates. Times when the practitioner does not take sessions are usually coloured grey. Move to the appropriate date and practitioner. Double click on an available time slot – this will create a “consultation”. This slot will be marked as reserved to reduce the risk of being booked by another user. Right click on the time slot to select an “encounter type” (if different from a standard consultation). Different types will be indicated in the appointment book by their icons. Once selected, the patients name will appear in the reserved time slot. 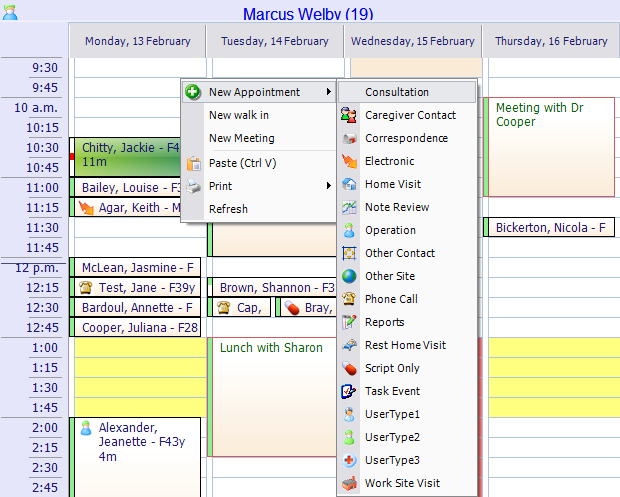 Right Click on an empty appointment slot and select New Meeting. Type in a description for this appointment. These record notes that relating to the whole day. A note will be made above the appointment book, so appointments can still be made on this day. Right Click on an empty appointment slot and select New All Day Event. Type in a description for this day.